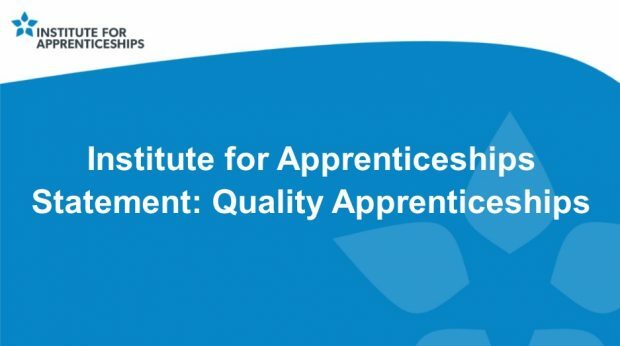 In September, the Institute launched a consultation to gain a broader understanding of what represents a quality apprenticeship. We asked employers, training providers, assessors and the public to help us define what an apprenticeship is, what a high quality apprenticeship looks like and how that should be judged. Our draft “Quality Statement” received 348 responses, and we’re grateful to all of those who took the time to get involved, and help shape the wider apprenticeship landscape. Three-quarters of you agree with of our definition of an apprenticeship, and you overwhelmingly agree that the needs of the apprentice are equally as important as those of the employer. The survey also indicated you’re strongly in favour of an initial assessment of both the job role and the apprentice against the standard, to be required for all apprenticeships. Similarly, you’re in favour of a Commitment Statement signed by all parties, describing the prior learning and job role, together with a description of the training programme. Transferability of skills was another significant aspect which you thought should be at the heart of standards development, to ensure apprentices complete the process with a wide range of sector-wide skills, not just the narrow needs a single employer. We’ve also received some valuable feedback on the proposed indicators with lots of good ideas on potential measures of success. These are just our headline results. We have now published a final Quality Statement, which will form the basis of our work with Trailblazers, to deliver high-quality apprenticeships to meet our economy’s needs. The quality statement is published on our website based on feedback from the consultation.